Essaibi-George, chair of the committee, began the hearing by saying that untreated mental illness is a significant factor in the increasing suicide rate in the United States. However, Essaibi-George said research shows some groups are more vulnerable than others. Suicide is the second leading cause of death among college students, she said, and rates of suicide and mental illness are much higher among LGBTQ people, especially those who are transgender, homeless, veterans or are racial minorities. John Bradley, chief of psychiatry and mental health service deputy director at the Veterans Affairs Boston Healthcare System, said during the first panel that there are many factors contributing to suicide rates among veterans, but that they are most highly correlated with access to firearms. Bradley also said suicide rates in Massachusetts are lower than the national average, both among veterans and non-veterans. 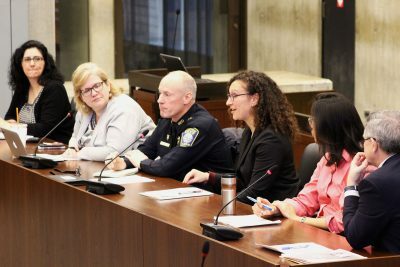 Michael Stratton, a deputy superintendent in the Boston Police Department, proposed a new unit of officers whose sole purpose would be to provide outreach to Boston communities. Community members also gave testimonies about their experiences dealing with mental illness and suicide. Oakley said that the experience taught her the importance of having strong relationships. It was through the relationships she had built, she said, that she was able to confide in someone about considering suicide and get help. David O’Leary, chair of the Boston chapter of the American Foundation for Suicide Prevention, who spoke in the third panel, said that it is important to normalize mental health discussions. “Normalizing this conversation which, for so long, has been something that many people were reluctant to talk about, is, we believe, one of the first steps that we can take to finding people who are struggling and saving lives,” he said. O’Leary said asking someone directly about their mental health and thoughts of suicide will not give them the idea or talk them into suicide but will instead open a dialogue. “If you’re watching this, just ask,” O’Leary said, addressing viewers of the live broadcast of the hearing.